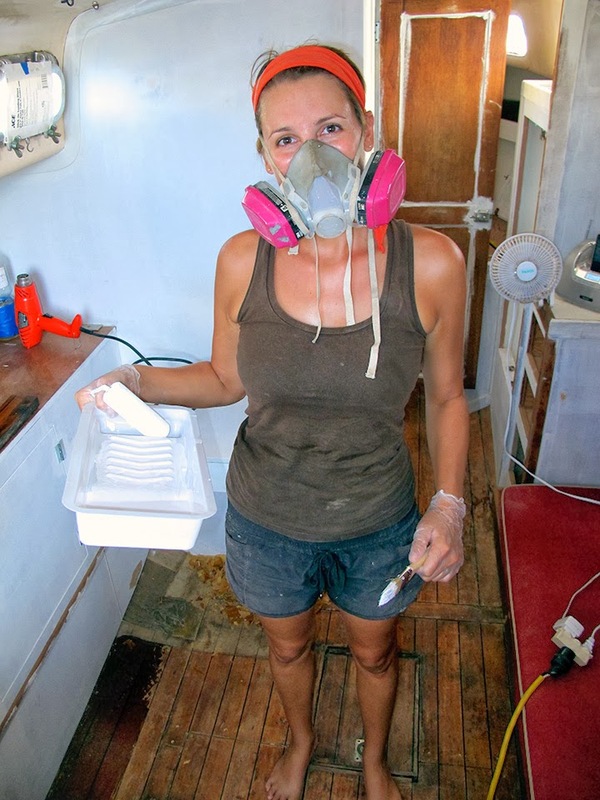 I know, I know, it's a SIN to paint the wood on a sailboat. When we told people that we planned to paint all the wood inside, we were met with comments such as 'but wood is so beautiful!' and 'you can't, it's traditional!'. 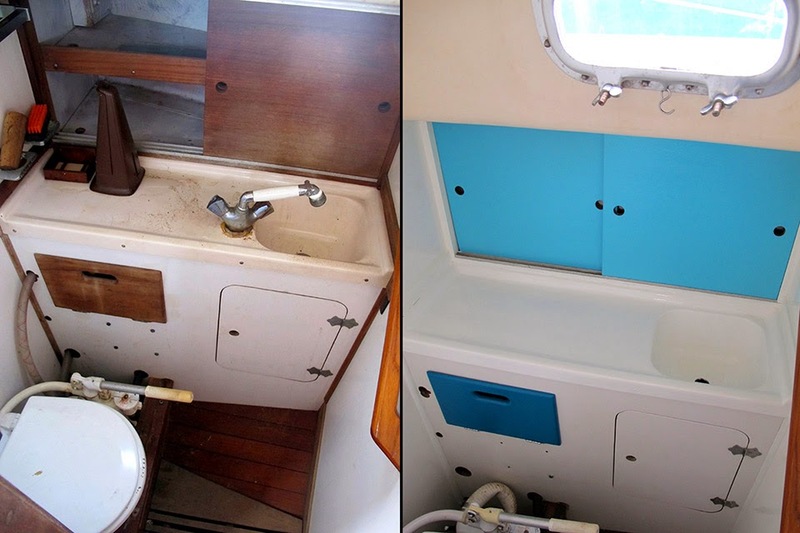 Yes wood trim is beautiful, but in my opinion a 33' boat is not the ideal place to showcase dark wood (not to mention the upkeep of it all). We both wanted a fresh, bright space that felt more like a beach cottage than a log cabin. Then after deliberating over paint colors for months, we bought 5 shades of exterior latex house paint in a semi-gloss. 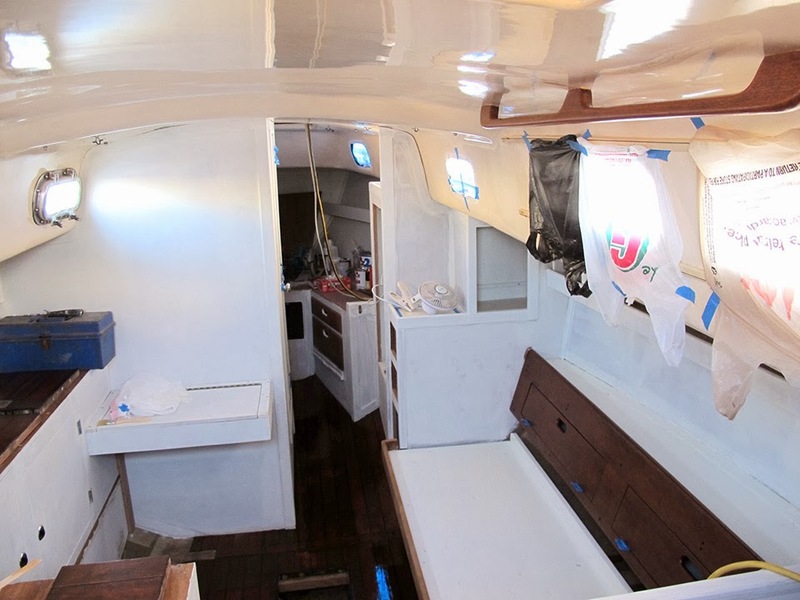 Since I wanted the trim to be super durable, I decided to paint it with Danboline bilge paint in white. That stuff is amazing! 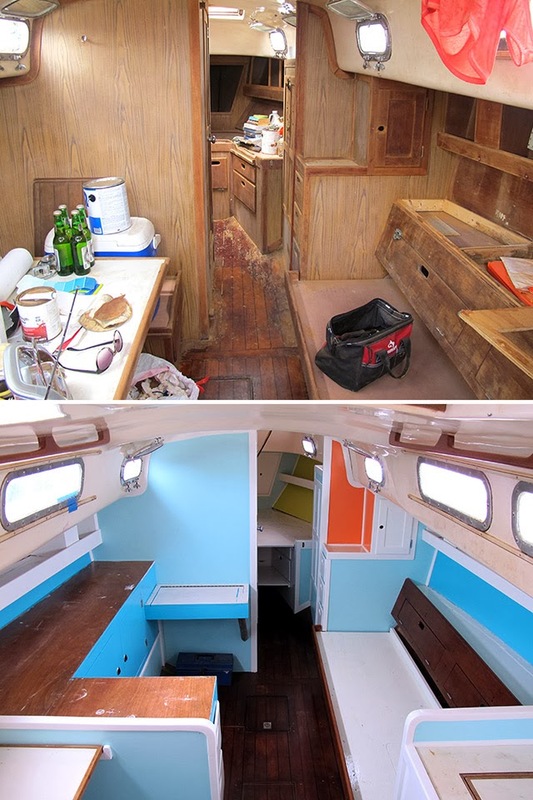 I fell in love with it after painting the bilge/engine room and realizing how great it covered and held up. I'm told it is only sold in certain countries because of the high toxicity, but the stuff works. No gumminess and it dries hard as a rock. And just in case your husband is 6'4" and is typically covered in oil/grease/diesel, it all cleans up very easily with a Clorox wipe. Clear Minwax Polycrylic as a topcoat and protective finish. The darker colors still felt sticky to me so I added this clear coat on top and it dried to a hard finish that was much better. LOVE it! Love your fresh colors very much. Oh my my my.....you painted all that sacred wood? Yippiee!!!!!! I always wondered what it would look like. Fantastic!!! I'm a lover wood and a great varnish job...but I also like a feeling of space and happy. You pulled off both. Congrats and thanks for sharing your awesome space. I know, I'm a sinner! I was getting all sorts of looks when I told people I was painting the entire interior. Thanks for the nice comment and for being open to appreciate both wood and paint! I would do the same thing if I ever bought a boat! Of course my current house has about 6 different paint colors in it, and features an electric blue door.... 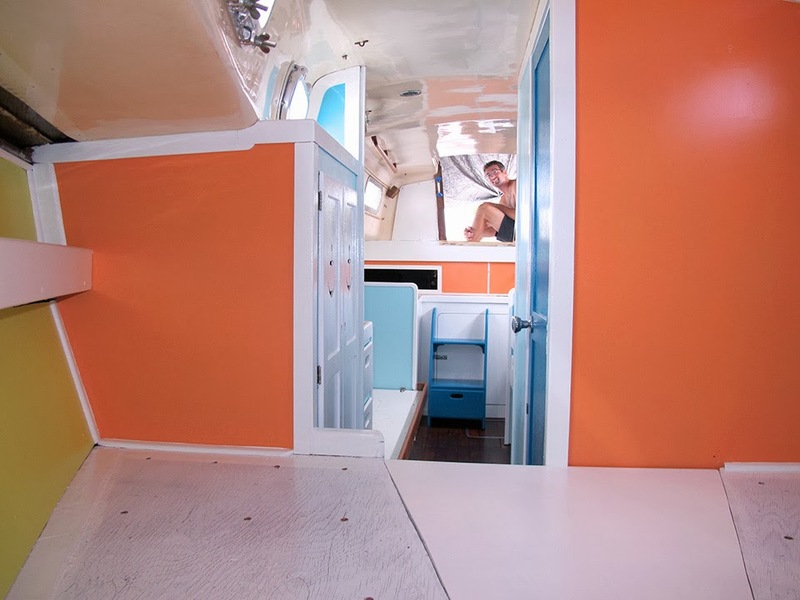 I love my wood floors but I like the paint because it makes the boat brighter and airier! This looks incredible! 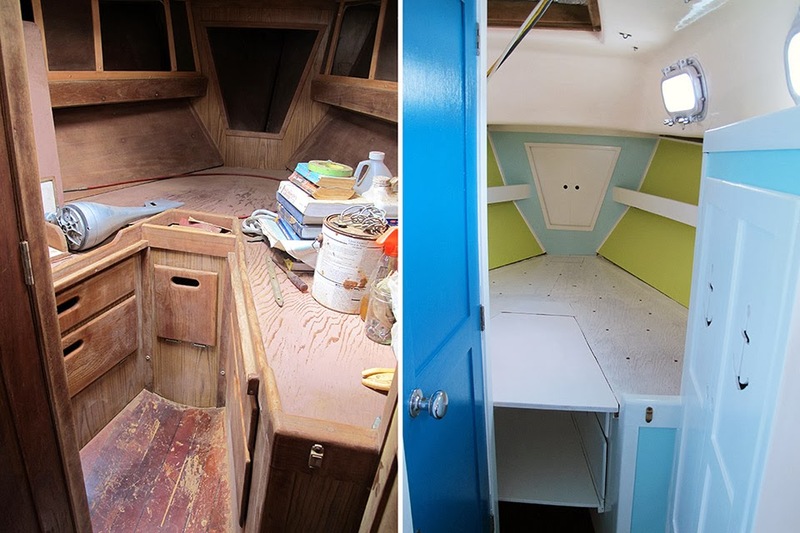 Did you paint the overhead/ceiling of the interior of the boat, as well? If so, what products did you use? 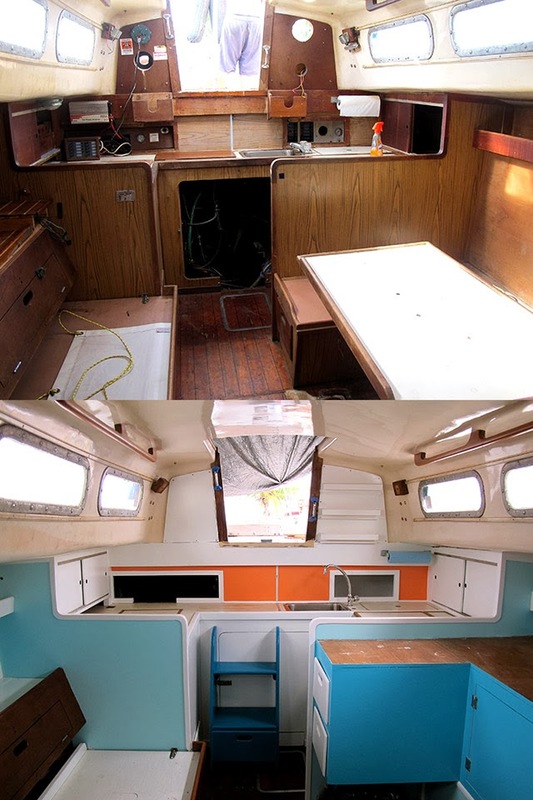 We are interested in renovating the interior of our 1975 Pearson. Curious if you painted any of the fiberglass? If so, what did you use? I am going to start working on a 1964 Cal 30 and want to freshen up the fiberglass on the interior. I too have a 1954 Cal 9.2 and I am removing the headliner (molded plastic ceiling). I will replace the old bolt nuts with acorn bolt nuts and want to paint the fiberglass ceiling white. I am wondering if you painted over the fiberglass as well or did you have a drop ceiling? If so, what paint did you use. Just realized I never responded to anyone about the headliner! Whoops! Sorry about that. 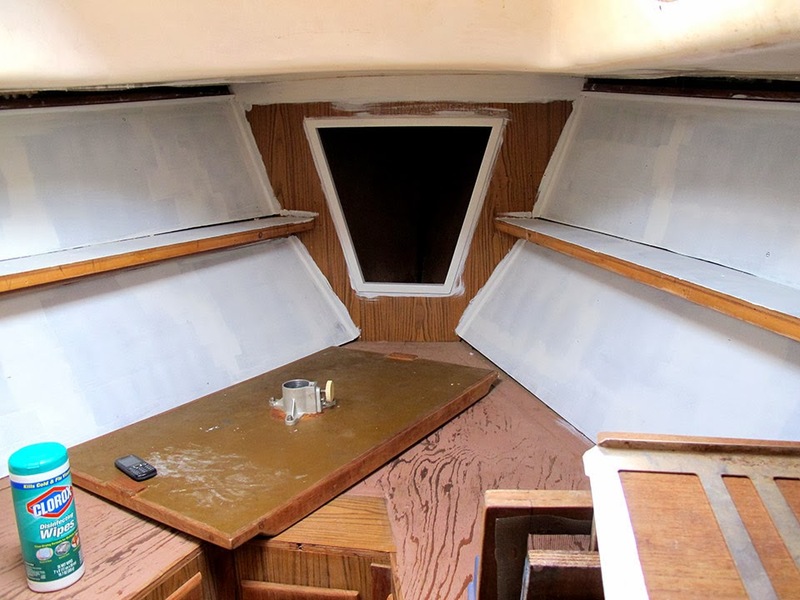 I never did paint the fiberglass headliner in our boat. I left it b/c I was dreading the huge task of painting it, but also b/c I was concerned about what to use and if it would stay on there. In the end I just magic erased dirty spots and then buffed the whole thing with 3M Restorer Wax. It is still discolored with spots here and there, but looks much better. No one ever notices it, but me either :) And the nice creamy yellow color is easier on the eyes than new bright white (my justification haha!). Good luck! My wife and I bought a boat last year and sailed up from the Caribbean to Boston. We plan to sail down again after the hurricane season is over. She always thought the dark wood interior is too dark but I haven't had the thought that a simple (I know the sanding part is not that "simple") paint job would do such a change. As a long time sailor I would say the same about the wood, but after seeing what you actually did I just changed my mind! beautiful! now that you've had it for two years, would you still recommend the exterior house paint? 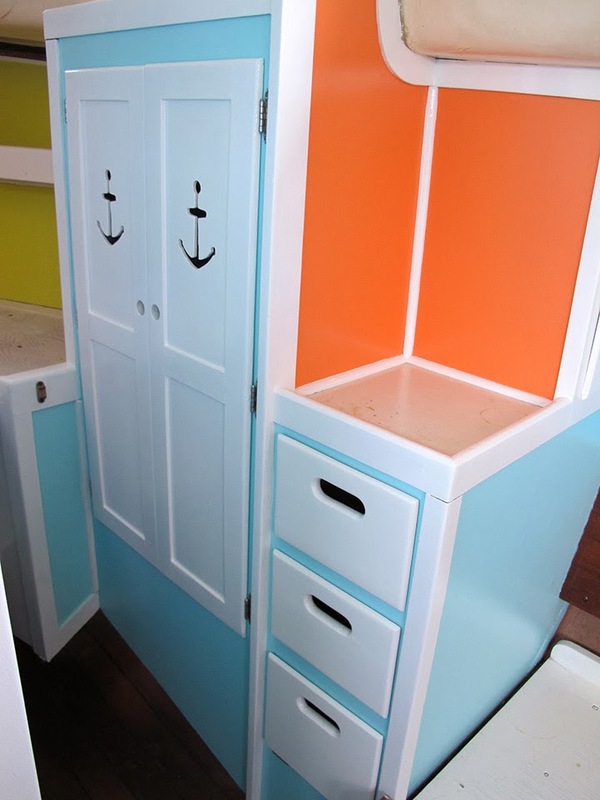 I'm going to tackle our new to us sailboat cabin over this winter and hoping this has been holding up ok for you? how much of each paint did you need? I would imagine a quart of each would probably do it? Thanks! I did a quart of each color and had some left over for any touch ups needed. I did apply a coat of clear Minwax Polycrylic over the darker colors later on b/c they still felt a bit sticky after some time. The Polycrylic dried harder and made clean up easier. Using an oil-based paint would really be better, but I didn't have access to it. Good luck!! Sailboats can be oppressively dark at times. I like what you've done! I just wondered did you used the International Danboline Paint and coat everything in white? Then used the other paints on top of this? Also how much of the danboline paint did you get and how many coats did you do?